Stretch it out! I’ve started taking yoga for the first time in my life. I’ve done it several times now. I cannot believe how hard it is. It looks easy, but I end up a shaking, sweaty mess of jiggly. But I love it! It is very centering and focuses on peace as well as core strength. Where has it been my whole life?! Right here. Me, ignoring yoga. I know, I know. In my defense, I waited until I knew I would receive the most from it. It was something to look forward to, to really get into, and to enjoy it at this stage in my life, where my children are almost all grown and out of the house. This is for me. Inhale…and stretch. Hold the pose…exhale. Whoooosh! So anyway, oddly enough, I chose a seagull to paint this week, a seagull doing a leg stretch not too dissimilar to a yoga move I am trying to master. 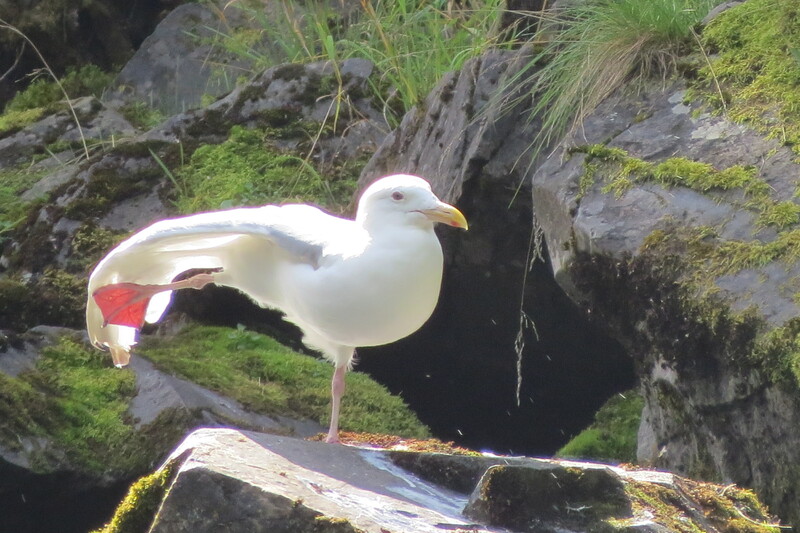 I took the photo on our wonderful Alaska trip, zooming in on the bird perched beside the river. As I snapped off photos, he gently and gracefully stretched out his leg. Bam. Got it. Looked easy enough for him. He did NOT do any wobbling or sweating that I could see. The challenge I set up for myself was to paint this smoothly textured bird on a highly textured surface. 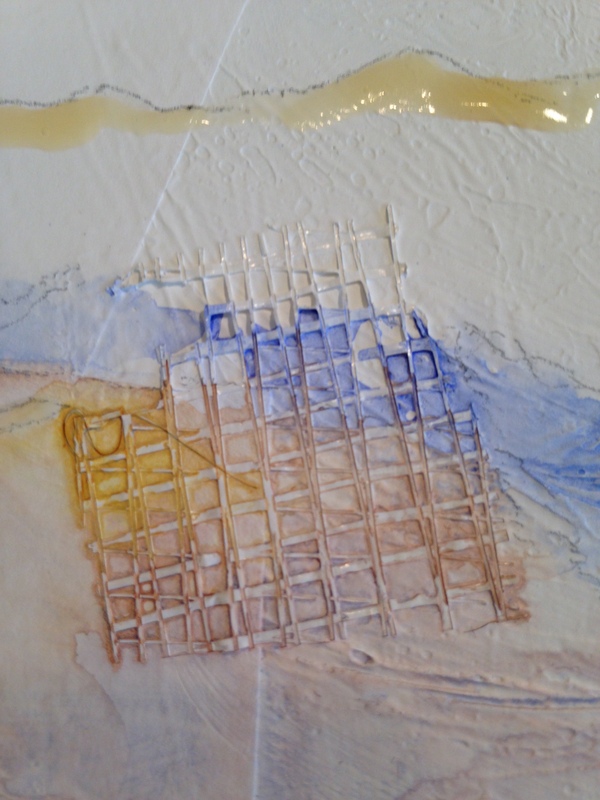 I began by creating grids using onion bag netting. 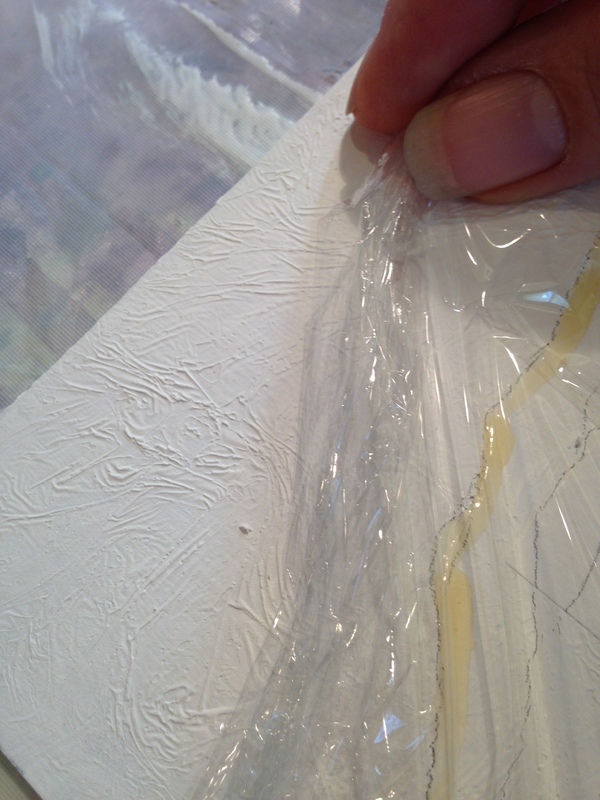 I also added plastic wrap into the wet gesso to give the surface a water-like texture. After everything dried, I worked on the composition, playing with a tightly cropped view of the bird to add an unusual composition to the painting. 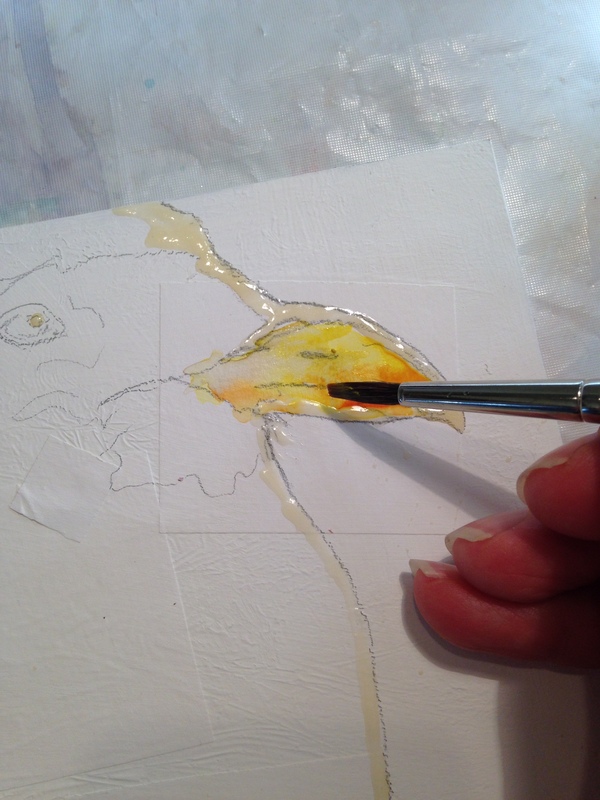 Next, I placed a liquid mask on the edges of the bird to keep the whites clean. Next, the fun part: Adding color! I love to see how the watercolor moves across the textured surface, creating interesting patterns and color mixes. I began with the seagull bill, keeping the yellow pure, and avoiding contamination of the dark background I planned. 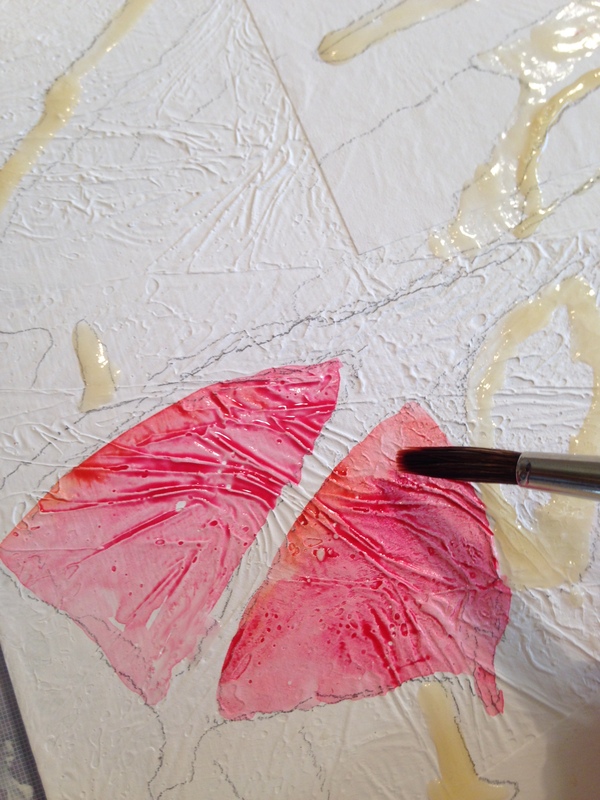 I used lemon yellow and new gamboge, as well as a touch of quinocridone coral from Daniel Smith. The seagull foot came next, with rich wash of quinocridone coral on his outstretched toes and webbing. Look at the amazing texture in these feet, caused by the wrinkles from the plastic wrap. Pretty cool, huh? When planning these paintings, I allow the chaos of texture to be a random act. In other words, most of the time, I create texture in the surface of the painting in a random manner, which forces me to paint around and through it, creating beauty from the chaos. This is not unlike life. There are wrinkles and disturbances to our souls; to our daily interactions. Life is not perfect. It is not planned to the utmost. 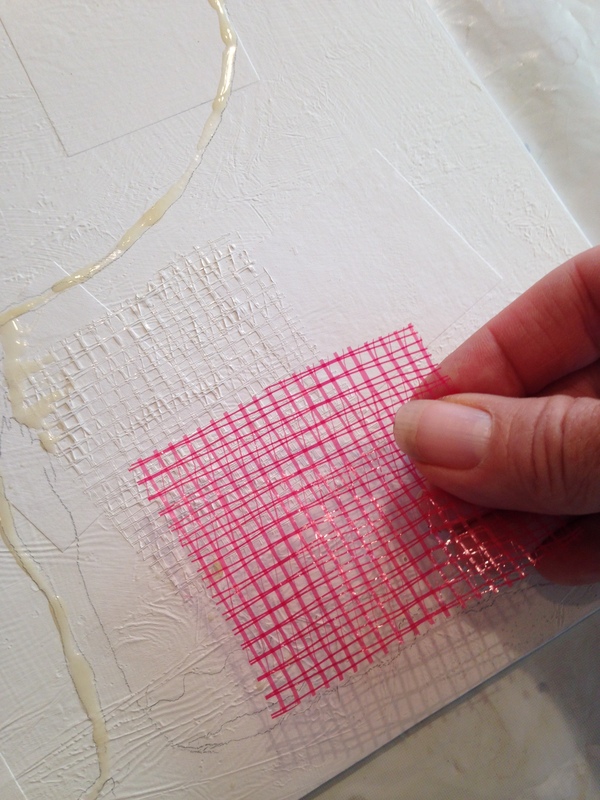 In creating random texture, I add a disturbance to the surface of the canvas that is not perfect. It pushes chaos. I have to work with it, acknowledge it. In the end, it creates much more interest and intrigue than a smooth, perfect surface. Just like our lives. We are strong, brave, and imperfect in all our glory. Bonus! A time-lapse movie of this bad boy coming about. Please excuse my video. Movie-maker extraordinaire I am not, but you can see the process! The title, “Bird Pose” is not really what a bird pose in yoga looks like. Okay, so I took artistic liberty?! I’m a newbie at yoga? Explain it a way as you wish, but I still like the title, “Bird Pose”. Texture and gridded dots appear in areas of the painting to remind us all that we are not perfect, but beautiful the same. 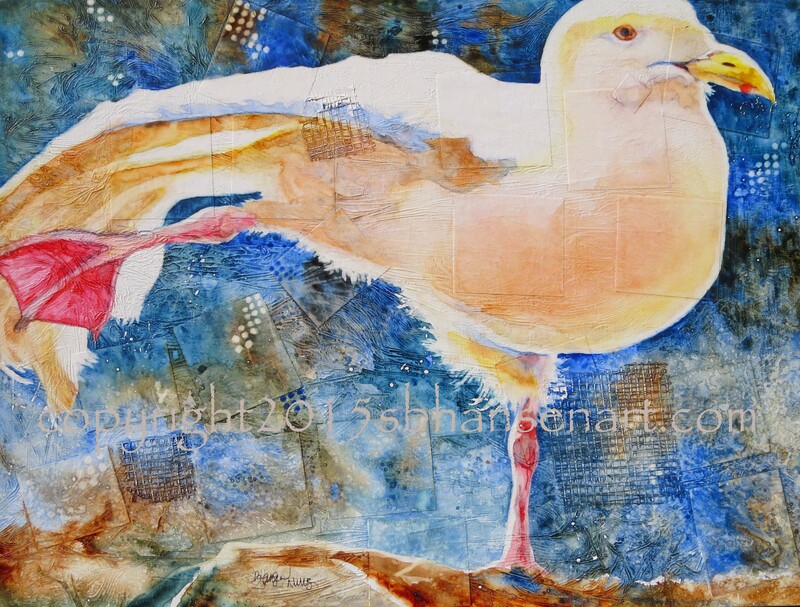 Bird Pose, $325, 12×16 original watercolor on textured Plexiglas, available for sale. Contact artist. This painting has been sealed and does not need to be framed behind glass. “Bird Pose” is currently available at my studio. Questions? Send me an comment. Prints available, sizes starting at 8×10 for $25. Check back; I really AM working on an online store that will print my prints for me. I sell greeting cards of all my images, to you, and retail stores. Let me know if you would like to purchase. Follow me on Facebook and Twitter and follow this blog to be informed of amazing new paintings and deals! Contact me to receive my newsletter so that you see me at showings and receive notifications about SB Hansen Watercolor & Wine Painting Classes. This is beautiful! It’s so nice when we can devote our practice to our artistic expression. You’re incredibly talented. Have you thought about painting any mandalas or Sanskrit symbols to hang in the space where you do your practice? I can’t wait to have my own at home yoga studio. Yay! I can’t wait to see what turns out!